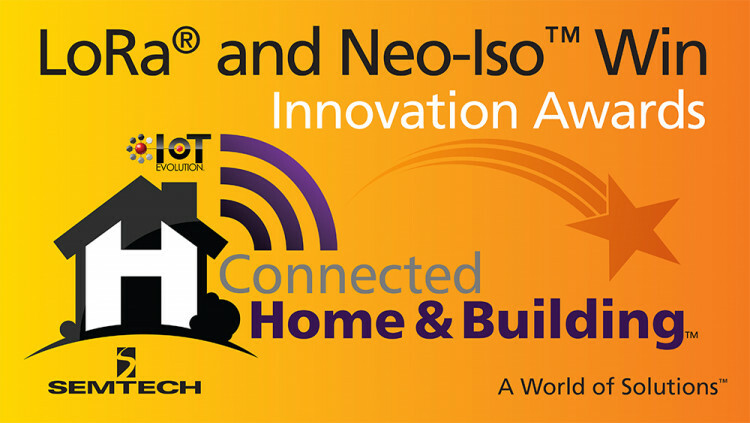 Semtech Corporation (Nasdaq:SMTC), a leading supplier of analog and mixed-signal semiconductors, announced today that its LoRa® Devices and Wireless RF Technology and Neo-Iso™ Smart Switching Platformboth received IoT Evolution Connected Home and Building Awards from IoT Evolution magazine, a leading publication covering Internet of Things (IoT) technologies. “The solutions selected for the IoT Evolution Connected Home and Building Award reflect innovations driving the fast-growing Internet of Things marketplace. It is my honor to congratulate Semtech for its innovative work and contribution to this rapidly evolving industry,” said Carl Ford, CEO of Crossfire Media, a co-publisher of IoT Evolution Magazine. The Connected Home and Building Awards honors organizations delivering software or hardware solutions which enable the advancement of the smart home and building industry. Semtech LoRa Technology is a widely adopted low-power, long-range solution for IoT that gives telecom companies, IoT application makers, and system integrators the feature set necessary to deploy low-cost, interoperable IoT networks, gateways, sensors, module products, and IoT services worldwide. IoT networks based on the LoRaWAN™ specification have been deployed in over 50 countries. Semtech’s Neo-Iso Platform is a galvanic isolated intelligent power switch family that is optimized for compact, low-voltage IoT applications, such as smart thermostats, security and smart home automation systems. Its superior system flexibility, monitoring and diagnostic capabilities make it an ideal solution for reliable smart home systems that come in various shapes and sizes. Learn how LoRa enables IoT, visit Semtech’s NEW LoRa/IoT site. Engage with the NEW LoRa Community. See the key features of the Neo-Iso Smart Switching Platform. Contact Semtech’s support team for technical support or general product inquiries. Follow Semtech on Twitter, LinkedIn, Facebook, and Google+. All statements contained herein that are not statements of historical fact, including statements that use the words “will,” “designed to,” or other similar words or expressions, that describe Semtech Corporation’s or its management’s future plans, objectives or goals are “forward-looking statements” and are made pursuant to the Safe-Harbor provisions of the Private Securities Litigation Reform Act of 1995, as amended. Such forward-looking statements involve known and unknown risks, uncertainties and other factors that could cause the actual results of Semtech Corporation to be materially different from the historical results and/or from any future results or outcomes expressed or implied by such forward-looking statements. Such factors are further addressed in Semtech Corporation’s annual and quarterly reports, and in other documents or reports, filed with the Securities and Exchange Commission (www.sec.gov) including, without limitation, information under the captions “Management's Discussion and Analysis of Financial Condition and Results of Operations” and “Risk Factors.” Semtech Corporation assumes no obligation to update any forward-looking statements in order to reflect events or circumstances that may arise after the date of this release, except as required by law. Semtech, the Semtech logo, LoRa, LoRaWAN and Neo-Iso are registered trademarks or service marks, or trademarks or service marks, of Semtech Corporation and/or its affiliates. Third-party trademarks or service marks mentioned herein are the property of their respective owners.